Recently I have had the complicated pleasure of helping some friends sort their way through finding out that their children are autistic. It is a pleasure because I truly love them and am blessed to walk with them on their journeys, and I am blessed to be able to share mine with them. It’s complicated because, well, it is autism. One of the things that has come up a few times is the idea that our kids are alright, and that following that line of thinking, should we skip some of the supports available or deny some of the funding that is accessible? Where I live, there are a lot of options. There are a lot of support choices. Not as many as I personally would like, mind you, but still a lot. There are behaviour intervention choices. There is speech language support, occupational therapy support, counselling, art therapy, and play therapy. There is funding for supplies and reinforcers, parent education, for travel to get the education, and for respite. Geometric block design created and photographed by Jake. While I am working locally and within my school to help reduce the stigma surrounding getting your child an assessment, and having an autistic child, I am constantly reassuring parents that yes, indeed, there is nothing wrong with your child. There is nothing wrong with your autistic child, or your child with special needs. There is nothing wrong with being different, there is nothing wrong with having a disability. I have been preaching this message of acceptance to everyone whenever I get the chance. But I have been surprised at one of the results. The question of whether to get or use money that we don’t need has come up. And guilt has come up. Should I use money to buy things such as colour ink so that we can print off pictures of all of our favourite Mario characters? Or is that a waste? Should I feel guilty applying for a credit on my taxes for raising a dependent with a disability? I thought autistic people were okay? Okay. So. No. No guilt. No shame. No worry. Yes. Our kids are alright. Yes. They are different. But yes, they have a real disability. That disability is largely a result of the way our society is structured and the way the rest of us understand and communicate. But it is real. Autism is both a real difference and a real disability that requires accommodation. Different people require different accommodations, and not everyone will go through ink at the same rate—for us, it is both a special interest and a reinforcer. But accommodations are required. I have to make the same food every school day. I have to provide food that my very food-sensitive kiddos will eat. There is no funding here for special foods or supplements. But there is opportunity to get some money back on my taxes. I will take it. There is no funding here for me to spend time one-to-one with Jake, to spend time working with him on relationships. But there is funding for me to get a behaviour interventionist into our home to help him work through his struggles with Penny and Aiden. I will take it. It’s not that I haven’t struggled with guilt, but I have worked through those feelings. This is what I said to a dear friend today who asked me about the guilt applying to get money for supports she isn’t sure that she actually needs. If I believe that autism is a disability as well as a difference, then I believe that accommodations are required. And I do. And if I believe I am making accommodations then it is not wrong to be reimbursed for them. And if I am working as hard as I believe I am to support and accommodate, it is not wrong for me to get every single penny available to support my sanity, my heart, my well-being, because that directly supports my family and those who need that support. No guilt. None at all. Another geometric block design created and photographed by Jake. There are ridiculous statistics out there. There are horrible videos of moms crying and whining. There are parents who let the stress of dealing with autism destroy their marriages and families. That is not happening here. I am not ever going to go online and describe how terrible things really are. I am not ever gong to go online and talk about how I cannot handle my autistic child. I am not ever going to leave my husband because things are too insane. Because I have support available. Because my pride will not get in the way of me accessing that support. Because I believe that things are not always terrible, even though sometimes they can be. Because part of looking out for my children means being smart. Because part of looking out for my children means that I have to look after myself. Because I believe that education and understanding can change everything. Because there are incredible advocates who have paved the way for us to join an incredible community where support and accommodation are normal, needed, and accepted. It has now been almost two years since we received Jake’s diagnosis. I am starting to see some of the ways God has His hands in our family and our situation. I had just finished an incredibly stressful and emotional year of teaching more than I really felt I should, as I wanted to be able access my Maternity Benefits when Penny was born. I didn’t know if, when, or how I would be able to return to teaching. I had just given birth to the sweetest, easiest baby my little family has ever known, and while I struggled with some post-partum depression, I had a better handle on it for many reasons, one of which was Jake. I had to deal with Jake. I had to get him to kindergarten, deal with everything we were learning about him, and then there was the diagnosis process. There was a lot to get up and focus on every day.I can see now how far I have come. I can see better where I want to go. I am coming to grips with what my Father has asked me to do. He has asked me to Mother these kids. I get to teach now, a wee bit, on-call, just a taste of other people’s classrooms, and it is wonderful. I cannot commit my heart to a class, to spending my precious minutes on prep and marking, because I have a high needs family. It’s okay. I have a special needs family. I don’t get to do more. This is all I can handle, and I can only handle it with help, support, loaned patience, grace, and strength. I just reread one of my earliest posts, The Role of the Parents, and I can see that I glimpsed the truth even back then. I wrote, “It’s so intimidating to think that I am the autism mom, the one that is going to have a gigantic impact on Jake and what he thinks of himself, what he eventually can do or not do, what he can cope with and what he just can’t.” Right now, I feel like it is becoming less intimidating, and more a part of my identity that I accept. But it’s not just how we roll now. It’s just that I am getting better at it. Back then, two years ago, in kindergarten, they sent the same forms home. Back then, I didn’t know if he was autistic or not. Back then, I told the photographer almost the same message, however. 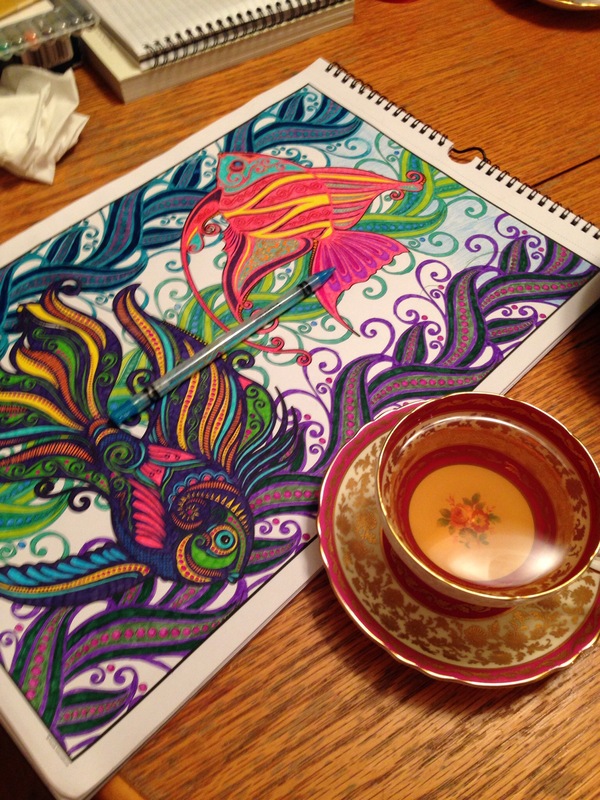 My colouring page, two fish, brightly coloured, with an antique and elaborate tea cup full of tea. How lovely. When I became an autism mom, my parenting took a direct turn. But I do not, cannot, become stagnant. This incredible, amazing, beautiful child requires more of me, and God has asked me to do it. So I have been reading, literally, for two years straight, everything that I can find on how to do better, be better, make life better. I am really excited lately. This past month, as I have read, processed, prayed, and experimented with new ideas, something fundamental in my soul has opened up. It feels bright and light and vulnerable. I have stopped thinking of myself as a teacher who is on an extended maternity leave, and started thinking of myself as a full time Mama who gets to teach sometimes for a break. It’s honestly a little terrifying. I have always hated when my deep identity is forced to change. I struggled hugely with becoming a mother, with becoming an adult, with becoming a working mom, and trying to find pieces of myself which were lost along the way. So I am scared to be changing again. This time, I feel more that the actual change happened back then, two years ago. When everything in my life was lined up and organized by God so that I could shift into this new position. I’ve just taken two years to realize it. As such, it’s a little like cracking an egg. There are fractures that have been spreading over the past two years, and small chunks have flaked off along the way. All of a sudden, however, the shell of who I was has given way and a bright, new, stronger me is emerging. I’ve decided to organize myself and give myself some long term goals for this new facet of my identity. I will create a happy home that my family wants to be in. As we are a diverse and large group in a small house, I will model gratitude and a good attitude, I will focus on laughter, joy, peace and love. My children will learn how to manage relationships with each other and with their parents by watching me. I will teach them to love each other by modeling acceptance, compassion, understanding, and connection. They will grow into a family who remains connected over distance, time, celebration and hardship. I will be present. I will push thoughts of escaping out of my mind and create ways to enjoy and appreciate my kids. I will turn off my devices when they are talking to me. I will turn off my devices during special time with each child every day and I will turn off my devices in the time between dinner and bedtime. I will not drink alcohol to escape. I will not use their screen time as a chance to escape. Rather, I will pray. I will count to ten, or I will remove myself from the room for a few moments to calm down so that I can show them that the people who they are, that the efforts they make, are wonderful and appreciated. Their self-esteem will not be corroded by my lack of appreciation of them. The best way to teach them to value themselves is to show them that I value them. When I read them objectively, I hear idealism and can imagine other mamas in the same boat laughing and saying that they are unrealistic or don’t account for how hard life is. I get that. I really, really hate the pressure that is on moms these days and I would like to write more about that too. The dream of perfectionism or appearing to have it all together is real and does nothing but create feelings of inadequacy and shame. However, when I look at my goals personally, and hear the love, journey, and calling of my Father to them, I feel like they are more than possible, they are foundational. I have been reading Desperate: Hope for the Mom Who Needs to Breathe by Sarah Mae and Sally Clarkson and it really affected my thinking. These goals are things I’ve always wanted and tried to do, the difference right now is that I am setting them as the priority knowing that Jake, Aiden, and Penny are my Calling right now. Because really, I cannot expect Jake to be able to manage his autism or his anxiety without me fully plugged in. He has so much to learn about himself. He is incredible, but he is only seven, and I am going to advocate for him and pour love into him until he really knows how wonderful he is. The same goes for Aiden and Penny. I can’t think of anything more important in my life right now. Ha! Balance. God tells me I must not forget balance. Alright. So somehow I will remember to take care of my marriage and myself too.